In 2017, 37,133 people died in motor vehicle crashes. Research shows that the vast number of vehicle crashes are tied to human error. NHTSA is working to promote safety through sharing information on vehicle technologies that hold the potential to reduce the number of crashes and to save thousands of lives every year. Learn more about NHTSA's work to bring these technologies to America's cars and trucks. NHTSA stands at the forefront of new and evolving vehicle technologies, working alongside industry partners and safety advocates to ensure vehicle buyers have the latest information regarding safety equipment. Driver assistance technologies not only keep drivers and passengers safe, but they keep other drivers and pedestrians safe, too. 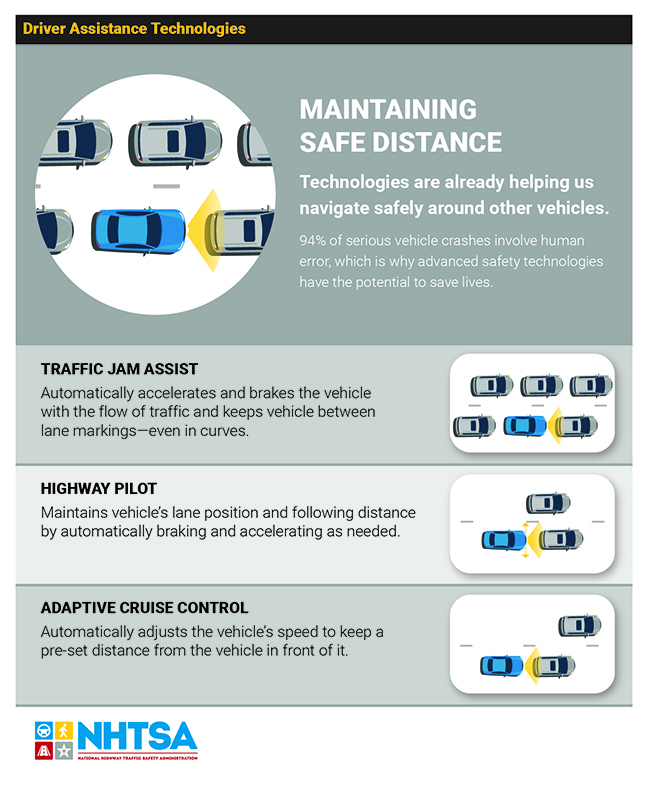 Automakers are constantly developing and implementing these new technologies, while NHTSA shares safety-related performance data and explains to the consumer how these new technologies work. From blind spot detection to braking systems, find the latest in driver assistance technologies below. What are automatic emergency braking systems? Automatic emergency braking (AEB) systems detect an impending forward crash with another vehicle in time to avoid or mitigate the crash. These systems first alert the driver to take corrective action and supplements the driver’s braking to avoid the crash. If the driver does not respond, the AEB system may automatically apply the brakes to assist in preventing or reducing the severity of a crash. 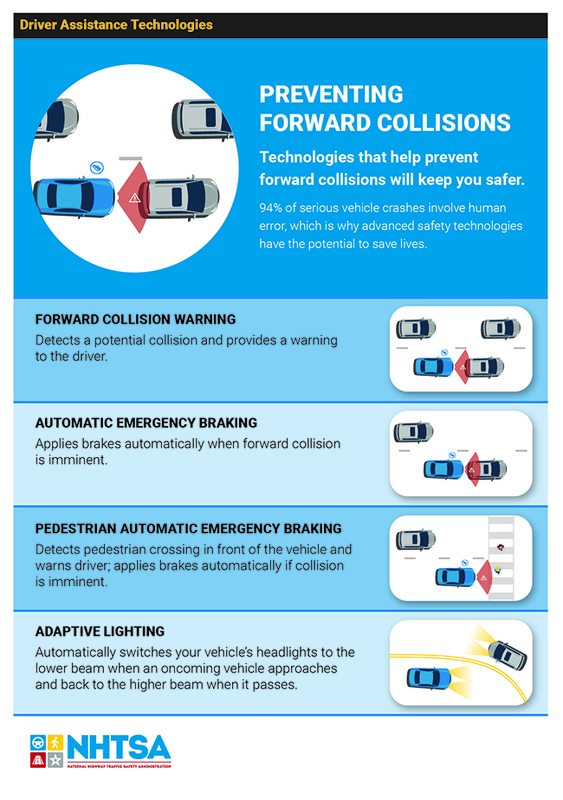 NHTSA believes these technologies represent the next wave of potentially significant advances in vehicle safety. The AEB systems’ engage dynamic brake support (DBS) or crash imminent braking (CIB) to potentially save lives and reduce moderate and less severe rear-end crashes that are common on our roadways. If the driver brakes, but not hard enough to avoid the crash, DBS automatically supplements the driver’s braking in an effort to avoid the crash. If the driver does not take any action to avoid the crash, CIB automatically applies the vehicle’s brakes to slow or stop the car, avoiding the crash or reducing its severity. In 2015, 33.4 percent of all police-reported crashes involved a rear-end collision with another vehicle as the first harmful event in the crash. NHTSA believes that advanced crash avoidance and mitigation technologies like DIB and CBS systems could help in this area. NHTSA’s extensive research on this technology and on relevant performance measures showed that a number of AEB systems currently available in the marketplace are capable of avoiding or reducing the severity of rear-end crashes in certain situations. How much will these technologies add to vehicle cost? Crash imminent braking and dynamic brake support have been available on some vehicle models in the United States since 2006. CIB and DBS systems are typically included in safety technology packages as optional features. Manufacturers are using a number of different sensor combinations in production-level AEB systems. The agency conducted a cost analysis of several production-level systems and found that the system cost varies significantly depending on the type and number of sensors used. Does NHTSA recommend CIB and DBS? Yes. CIB and DBS systems that meet NHTSA’s performance specifications are indicated with an icon under the NHTSA ratings category Recommended Safety Technology. We recommend that you look for this technology when shopping for a vehicle. CIB and DBS systems are an option on many new cars, SUVs, and trucks. To find out if CIB and DBS are available in the vehicle you’re interested in buying, visit NHTSA’s 5-Star Safety Ratings and search for 2011 vehicles and newer. What is pedestrian automatic emergency braking? A pedestrian automatic emergency braking (PAEB) system—also known as frontal pedestrian impact mitigation braking—is an emerging safety technology that provides automatic braking for vehicles when pedestrians are in front of the vehicle and the driver has not acted to avoid a crash. A PAEB system is a crash avoidance system that uses information from forward-looking sensors to automatically apply or supplement the brakes when the system determines a pedestrian is in danger of being hit by a vehicle. PAEB systems typically use cameras, but some also use a combination of cameras and radar sensors. What types of crashes does it prevent? 4. Heading straight and a pedestrian is walking along or against traffic. NHTSA has not set performance specifications for this feature, but NHTSA recognizes PAEB as a promising technology that may be added to the 5-Star Safety Ratings list of recommended technologies in the future. PAEB systems are an option on many new cars, SUVs and trucks and can help you avoid a crash. To find out if PAEB is available in the vehicle you’re interested in buying, check the manufacturer’s website. What is a rearview video system? A rearview video system (RVS), also known as a backup camera, is a safety technology that helps prevent back-over crashes and protect our most vulnerable people—children and senior citizens. By providing an image of the area behind the vehicle, backup cameras help drivers see behind the vehicle. When a driver shifts a vehicle into reverse, the RVS shows—either in the dashboard or in a small display in the rearview mirror—an image of the area behind the vehicle. The field of view includes a 10-foot by 20-foot zone directly behind the vehicle. It’s important to remember that rearview video systems are not a replacement for mirrors or turning around to look; rather, they’re an added safety tool for revealing hidden dangers. Does NHTSA recommend rearview video systems? Yes. By May 2018, NHTSA will require this life-saving technology on all new vehicles. Until then, we recommend you look for RVSs that meet NHTSA’s performance specifications when shopping for a vehicle. What is a forward collision warning system? A forward collision warning (FCW) system is an advanced safety technology that monitors a vehicle’s speed, the speed of the vehicle in front of it, and the distance between the vehicles. If vehicles get too close due to the speed of the rear vehicle, the FCW system will warn that driver of an impending crash. It’s important to note that FCW systems do not take full control of the vehicle or keep the driver from operating it. FCW systems use sensors to detect slower-moving or stationary vehicles. When the distance between vehicles becomes so short that a crash is imminent, a signal alerts the driver so that the driver can apply the brakes or take evasive action, such as steering, to prevent a potential crash. Vehicles with this technology provide drivers with an audible alert, a visual display, or other warning signals, and in this way, help prevent frontal crashes into the rear of slower moving or stopped vehicles. Does NHTSA recommend forward collision warning systems? Yes. FCW systems that meet NHTSA’s performance specifications are indicated with an icon under the NHTSA ratings category Recommended Safety Technology. We recommend that you look for this technology when shopping for a vehicle. FCW systems are an option on many new cars, SUVs and trucks. To find out if FCW is available in the vehicle you’re interested in buying, visit NHTSA’s 5-Star Safety Ratings and search for 2011 vehicles and newer. What is a lane departure warning system? A lane departure warning (LDW) system is an advanced safety technology that alerts drivers when they unintentionally drift out of their lanes without a turn signal. It’s important to note that LDW systems do not take full control of the vehicle or keep the driver from operating it. LDW systems use a camera to monitor lane markings and detect when a vehicle is drifting out of its lane of traffic. When it detects that a vehicle is veering out of its lane, an audio, visual, or other alert warns the driver of the unintentional lane shift so the driver can steer the vehicle back into its lane. A rollover, which often occurs when a vehicle leaves the road. Does NHTSA recommend lane departure warning systems? Yes. LDW systems that meet NHTSA’s performance specifications are indicated with an icon under the NHTSA ratings category Recommended Safety Technology. We recommend that you look for this technology when shopping for a vehicle. LDW systems are an option on many new cars, SUVs, and trucks. To find out if LDW is available in the vehicle you’re interested in buying, visit NHTSA’s 5-Star Safety Ratings and search for 2011 vehicles and newer. What is a lane keeping support system? 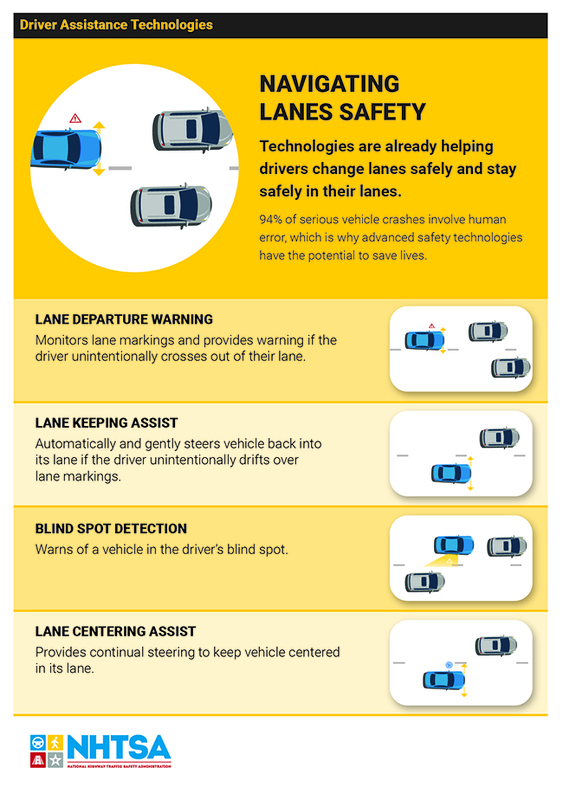 Using lane monitoring technology, lane keeping support (LKS) is an emerging safety technology that prevents drivers from unintentionally drifting out of their lanes. LKS systems use information provided by sensors in a lane departure warning system (LDW) system to determine whether a vehicle is about to move out of its lane of travel. If so, LKS activates by correcting the steering, braking or accelerating one or more of the wheels, or a combination of both, resulting in the vehicle returning to its intended lane of travel. Does NHTSA recommend lane keeping support systems? NHTSA has not set performance specifications for this technology. This technology may enhance the safety of the vehicle, and you may want to consider this technology when buying a new vehicle. What is blind spot detection? Blind spot detection (BSD) systems warn drivers with an audio or visual warning if there are vehicles in adjacent lanes that the driver may not see. The alert helps facilitate safe lane changes. BSD systems use digital camera imaging technology or radar sensor technology to detect vehicles in adjacent lanes and warn drivers of approaching vehicles. These systems are most effective when drivers are passing other cars, being passed, or making a lane change. Some systems also provide warnings when vehicles are an extended rear zone, and some provide warnings only if the vehicle’s turn signal is on. NHTSA has not set performance specifications for this feature, but NHTSA recognizes BSD as a promising technology. BSD systems are an option on many new cars, SUVs and trucks and can help you avoid a crash. To find out if BSD is available in the vehicle you’re interested in buying, check the manufacturer’s website. What are automatic crash notification systems? An automatic crash notification (ACN) system is an emerging safety technology designed to notify emergency responders that a crash has occurred and provide its location. In most cases, when the ACN sensor detects either that an air bag has deployed or that there’s been a dramatic and sudden deceleration, the system automatically connects to an operator, who will then be able to communicate with passengers in the vehicle after a crash. The operator is also able to collect basic information from the vehicle, without passenger input, to provide to emergency responders so they can easily locate and reach the scene of the crash. Automatic crash notification systems can reduce death and disability by decreasing the time it takes for emergency medical services to arrive at a crash scene and transport victims to a hospital. More lives can be saved and the severity of injuries reduced if a crash victim receives medical care as soon as possible, particularly within the first hour following a crash. ACN is especially beneficial to crash victims in rural areas, where there are typically fewer or no witnesses to call emergency responders. Does NHTSA recommend ACN systems? NHTSA has not set performance specifications for this technology. This technology may enhance the safety of the vehicle, and you may want to consider this technology when buying a new vehicle. Today, ACN systems are available as an option on many new cars, SUVs and trucks. 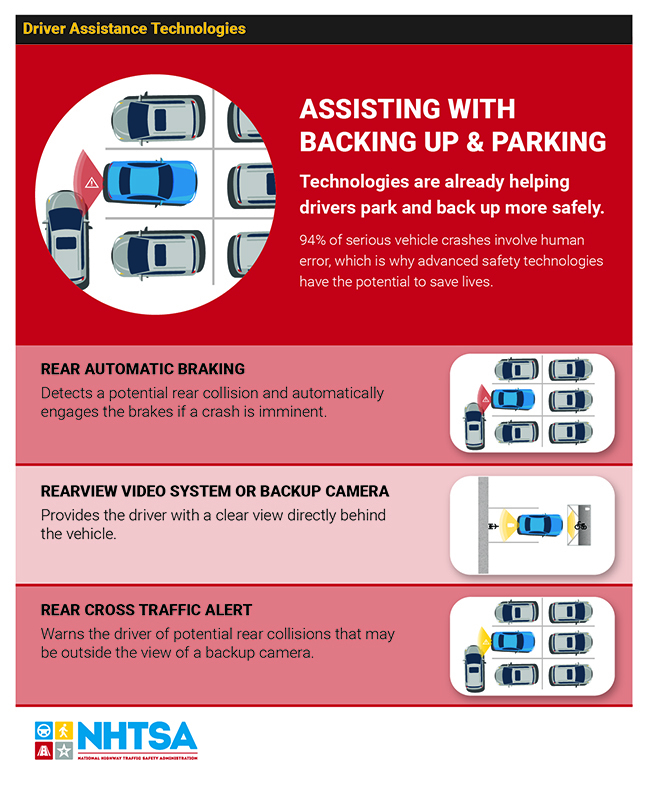 See how the various driver assistance technologies we already have in our vehicles keep us safe and secure on the road. Read more about the technology of tomorrow on the Automated Vehicles for Safety topic. Detects a potential collision and provides a warning to the driver. Watch Tested.com's Adam Savage demonstrate and explain this crash prevention technology. This is a NHTSA recommended safety technology that meets the agency's performance specifications. Applies brakes automatically when forward collision is imminent. Detects pedestrian crossing in front of the vehicle and warns driver; applies brakes automatically if collision is imminent. Automatically switches your vehicle’s headlights to the lower beam when an oncoming vehicle approaches and back to the higher beam when it passes. Provides the driver with a clear view directly behind the vehicle. Watch a video that demonstrates and explains this driver assistance technology. Warns the driver of potential rear collisions that may be outside the view of the backup camera. Monitors lane markings and provides warning if the driver unintentionally crosses out of their lane. Automatically and gently steers vehicle back into its lane if the driver unintentionally drifts over lane markings. Watch Tested.com’s Adam Savage demonstrate and explain this driver assistance technology. Warns of a vehicle in the driver’s blind spot. Provides continual steering to keep vehicle centered in its lane. Automatically accelerates and brakes the vehicle with the flow of traffic and keeps vehicle between lane markings—even in curves. Maintains vehicle’s lane position and following distance by automatically braking and accelerating as needed. Automatically adjusts the vehicle’s speed to keep a pre-set distance from the vehicle in front of it. What NHTSA recommended driver assistance technologies does my car have? If you own or are looking to buy a car, see what driver assistance technologies your preferred vehicle has. Through safety standards and consumer information, NHTSA demonstrates its commitment to reducing crashes and saving lives in the United States. NHTSA works diligently to inform consumers about the types of driver assistance technologies that are available and which technologies we recommend. We now know that driver assistance technologies are the right path toward safer roads. We will work diligently to bring you updated information whenever there is a new breakthrough in this technology.